FULTON = G. Ray Bodley High School’s annual Career Day connected students with dozens of professionals who provided insight on why, how and when their jobs propelled them into success. 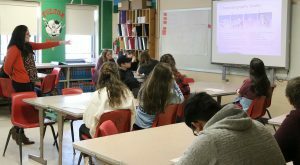 GRB graduate DaVanna Chetney Marks explains her career as a bio-molecular engineer to current GRB students during the school’s recent Career Day. Open to all GRB students, they each signed up for a few sessions during the half-day event. Career choices included, but weren’t limited to, roofing, photography, social work, funeral director, pharmacist, counseling, professional athlete, military, engineer, lawyer and cosmetology. Skip Clark, 92.1 The Wolf radio disc jockey and program manager, encouraged the high schoolers interested in his industry to follow their passion, get an education and work from the ground up. Clark then detailed his career path, station changes, job perks, adapting to how people receive music and expanding on his vocal talents. Being transformative, setting goals and having direction also was a theme during chef Bill Steele’s presentation. When asked by one student why he cooked, Steele shared the thrill he experiences when creating, presenting and sharing both his culinary and artistic skills. One of the most exciting presenters for GRB staff members was none other than 2007 GRB graduate DaVanna Chetney Marks, who explained about chromatography to those students interested in exploring a science career. School counselor Kelly Rickert beamed with pride after Marks’ discussion about her experiences working at Bristol-Myers Squibb. Marks said she hoped students would enter careers where they can help people.